While I recommend using PHD Guiding/EQMOD for guiding your mount, it is possible to add ST4 capabilities to the mount which will work even if EQMOD is connected, but *should* also work without a computer attached. 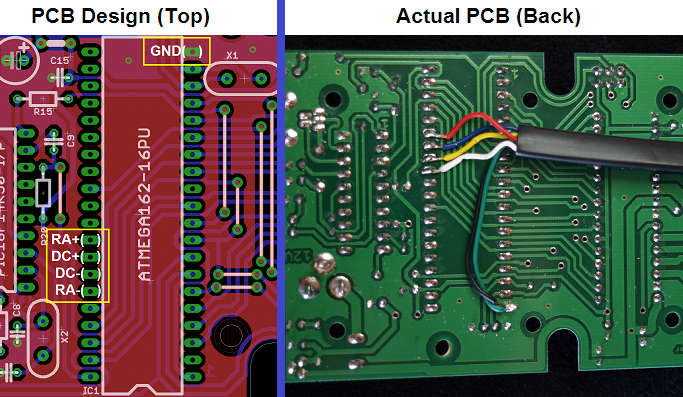 Adding an ST4 port is relatively simple, it is a case of soldering on 5 wires: RA+, RA-, DEC+, DEC- and GND. Instructions can be found below. The pins have internal pull-up resistors, so you can simply connect wires to these pins, and to the ground pin, and then solder on to an RJ11 6P6C type socket to attach your ST4 Cable. If you don't want to solder on a connector, you can use the GPKIT-EQ which can be bought from Shoestring Astronomy. Essentially this is just the end from an RJ11 cable soldered onto the board, and then an RJ11 female to female coupler. These assignments also apply to AstroEQ Controllers with Hardware Version 4.0. The version number is marked on the printed circuit board, but can also be identified by the fact that their isn't an ST4 socket footprint marked on the board. Later versions of AstroEQ were shipped with an unpopulated ST4 footprint. If you are looking for alternatives, you can use the datasheet from the farnell website to get dimensions, specifically the height of the connector. You also need to connect the two four pin headers, JP1 and JP2. These are located one below the IC, and the other next to the ST4 footprint. They should be connected as Pin1 to Pin1, Pin2 to Pin2, etc. (Pin1 is marked by a square box). If you find that the pins perform the wrong action - e.g. DEC+ causes RA-, then you can change these four cables around to find the correct order.